We've had a lot of successes with this go round of intensive occupational therapy that the boys are currently doing. Of note: Summy tried pudding, and went upside down on a swing for the first time. Jack's attending a bit better and overall getting a lot more from his sessions. He also successfully cut with scissors for the first time. However, there are some "down" sides to therapy. Summy in particular, has somewhat unraveled. He's started this weird grimacing thing. At first I worried it was a facial tic, but I am not sure...it comes and goes so much. For now, we are keeping our eye on it. The boys are still waiting to start therapeutic horseback riding. They are waiting for more volunteers. We've been asked to recruit, but we don't know a lot of people near us willing to devote an hour a week. Summer has been super busy. I have completed 5 semester hours and I am in the process of finishing 7 more. I feel overwhelmed, and like life has been very hard. I plan to post a bunch of pics from our visit with Emma, the boys' cousin, this weekend. Abby does this thing with her face too, and she shakes and tenses up while doing it. The therapist said its just sensory overload. The first time I saw it I freaked a little bit. I hope you guys are doing good, besides being so busy!! Good to hear your little ones are making progress with therapy. Good to read the kids are doing great. 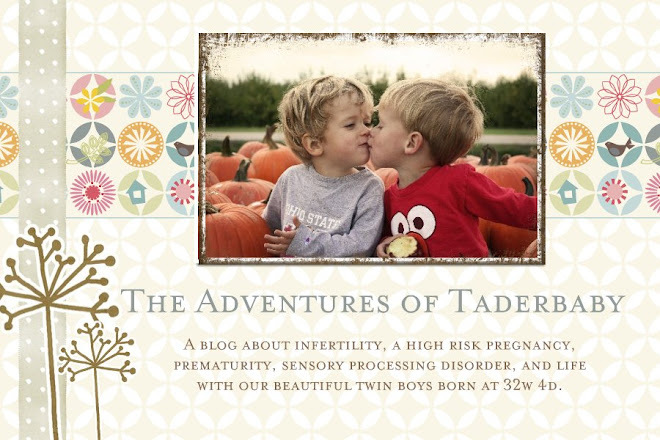 When I started this blog, I originally thought it was going to be a taderbaby...we chose the nickname after the delicious spuds served at Young's Jersey Dairy...but quickly found out it was tader tots! At 28 weeks gestation my placenta started abrupting and I was briefly hospitalized, then put on strict bedrest. At 31w 4d I was let up for an hour a day. At 32w on the dot, I was re-admitted for bleeding and began a four day fight to stop labor which I lost on 2.15.07 when Jack's placenta abrupted fully. If I hadn't been at the hospital, we wouldn't have made it. Upon birth, Jack's apgar was 3. 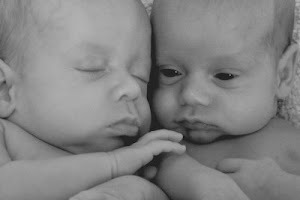 The boys spent 4 weeks in NICU and this is their story, and mine. 32 year old mom of preemie twin boys born at 32w 4d. Wife to David. Working mom. Elementary band strings and general music teacher. Kodaly educator. The Adventures of Taderbaby by Meghan Anderson is licensed under a Creative Commons Attribution-Noncommercial-No Derivative Works 3.0 United States License. Based on a work at taderbaby.blogspot.com.